Kiwi Pundit: Shooting the messenger: Are police impartial in searching Hagar, or is there another storm in Remuera “Teapot”? Shooting the messenger: Are police impartial in searching Hagar, or is there another storm in Remuera “Teapot”? A reader writes in NZ Herald: I see that police were ordered to search Nicky Hager’s home and files. Are they now going to be ordered to search Cameron Slater’s home and files? Are they going to search Judith Collins’ home and office for incriminating evidence? If justice is to be done then all the parties must be treated the same way. Who say “Dirty Politics” is a left-wing conspiracy? Does not it appear to be a right-wing tool? 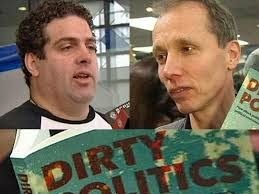 Cameron Slater (left) and Nicky Hager, with his book Dirty Politics which reveals wrong-doing and mischief-making emanating from Prime Minister's and some Cabinet Minister's Office in Beehive. Animal Farm? Are Police treating some as more equal than the others? Why selective enforcement of law? Dirty Politics? So, it appears Nicky Hagar’s efforts in compiling Dirty Politics has not gone in vain. He had cautioned us of dirty politics. And it seems he is the first victim of it within weeks of the election. Those who have read about wheeling and dealing emanating from top cabinet positions and directed from Prime Minister’s Office, would not be surprised at what is hypothesized above. 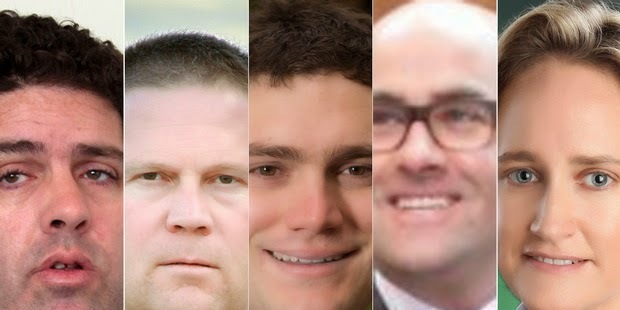 Labour’s Acting Leader, David Parker, who now appears to have a better Press Secretary (than Cunliffe), quipped: "While we respect the police's independence, we are concerned that an arm of the state appears to be being used against Mr Hager while nothing appears to be being done about the wrongdoing he exposed.” That is exactly the case where an analogy is made with John Bank’s in-famous Remuera “teapot tape” saga, where police were seen to be harassing the journalist at behest of Key. Acting Labour Leader was right is issuing a caution to police: “Nicky Hager was doing what the fourth estate ought to do and police need to take care to protect his rights and to avoid the appearance of intimidating the media." What? Dirty Politics? It is bloody left-wing conspiracy, with fictitious characters. Parker was right in calling the police to pay similar attention to investigating some of the issues the book had uncovered. In the present case, there is an appearance that they are seen to be pursuing a political agenda whilst not paying due attention to dirty tricks, mischief and unethical actions, bordering on illegal activities, alleged as a result of what Hager uncovered in Dirty Politics. Among others, this included any potential illegality in the accessing of Labour's website and using that information to undermine Labour Party. The other one is attempts to undermine then Serious Fraud Office head Adam Feely. Mr Parker rightly said that Dirty Politics had revealed serious alleged wrongdoings and issues on whether former Justice Minister Judith Collins was involved in undermining the Serious Fraud Office and whether the PM's Office was involved in misuse of power in its oversight of Official Information Act requests. It appears communications and media cell of Labour Party took a turn for the better for Acting Leader, who is able to come out emphatically on issues that could have highlighted misgivings of Government unearthed by Hagar. He cautioned police to take proper steps to protect journalistic privilege of those who are doing proper job to be a watchdog of democracy. That is where, as a First World Democracy, New Zealand needs to be wary of the brand of media which degenerates it as mere lapdogs of government in power. That is what Dirty Politics tried to warn. And that is where Labour Party failed miserably to score from the penalty spot, and in turn have been scoring own goals. Even now they appear to have a blind spot for a well-oiled communications and media department. If Matt McCarten has survived Labour’s eclipse, will somebody please communicate to him the importance of COMMUNICATION, COMMUNICATION, and COMMUNICATION.